I wanted to keep the “postcard” feel of the quilt going, so decided to just frame the individual pictures with small squares. The squares were all cut from leftover scraps from the blocks to tie it all together. I placed my coloured and black squares randomly, but I have seen a couple of samples where the small squares are more organized like a checkerboard pattern. I have also seen samples where the block pictures are reversed-whether intentional or serendipity, they look great! I also wrote words in the border with black thread- you have to look closely to see them. 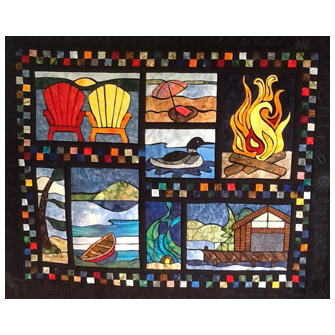 They all are words that tie with my Muskoka experiences; “swimming”, “northern lights”, campfires…..I then “wrote” the title Postcards From Muskoka, in a bright variegated thread so that it would stand out. 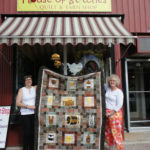 I will be at each of the shops for a half day during the Hop demonstrating stained glass quilting techniques and displaying some of my patterns. I’ll be bringing my sample with me and we can compare it to the shop samples. I love to see how people have made my designs. I’m thinking I may need to run a contest in order to get pictures of finished quilts; I’ll have to think about that one. I am teaching in the area before the hop so I’m off to pack up the car, Muskoka here I come! Can I order the pattern on line ? Should be here now under Project Bin-Stained Glass Quilts. Hope you like it! Leave a Reply to Cecilia Estey Click here to cancel reply.